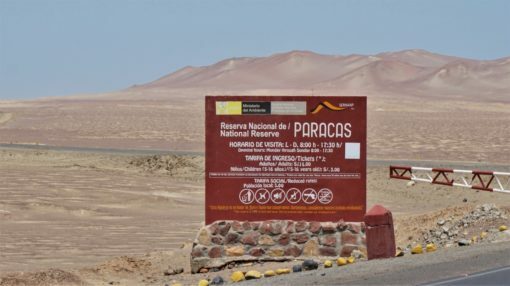 Paracas National Reserve lies 250 kilometres south of Lima, Peru. 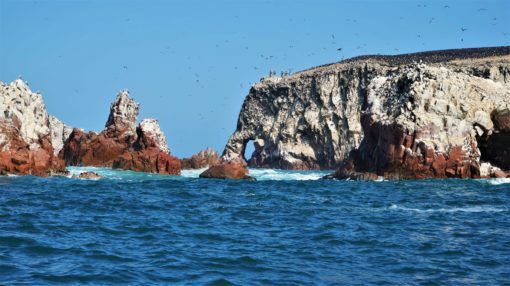 The tiny coastal town is built around tourism, with a plethora of hotels, hostels and tour companies offering trips to both Paracas National Park and Ballestas Islands boat tours. 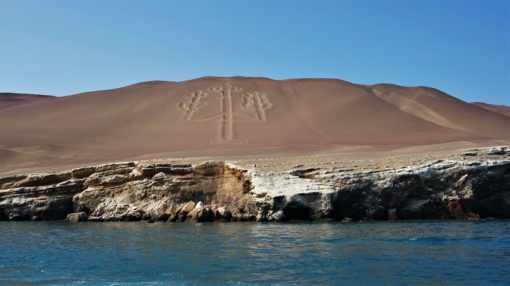 Some people take Paracas tours from Lima, either as a day trip or part of a package to nearby Ica for sandboarding and to see the Nazca Lines. The most common way to get there is to take a bus from Lima to Paracas independently which is what we did. We used the Cruz Del Sur Paracas bus, which was punctual and extremely comfy, the journey took just under four hours and cost £11 per person. You’ll be dropped at the station, which is just a 10-minute walk to town. You can also stop at Paracas if you’re travelling from Cusco, the Peru Hop bus company offers services from Cusco to Paracas and on to Lima. 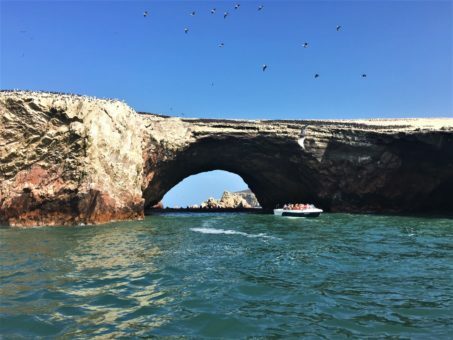 There are really only two things to do in Paracas: visit the Paracas National Reserve and take a boat tour of the Ballestas Islands. The day we arrived in Paracas the weather was too windy for boat trips to run the following morning, so instead, we booked a bus tour of the Paracas National Reserve, which spans 200,000 hectares of desert and ocean. The reserve is home to over 216 species of birds, plus various mammals, reptiles and fish. As the bus bumped through the desert-like landscape, we spotted flocks of long-beaked, exotic birds soaring along the jagged coastline. There were rocky mountains stretching as far as the eye could see, desolate and empty save for the few tourist buses. 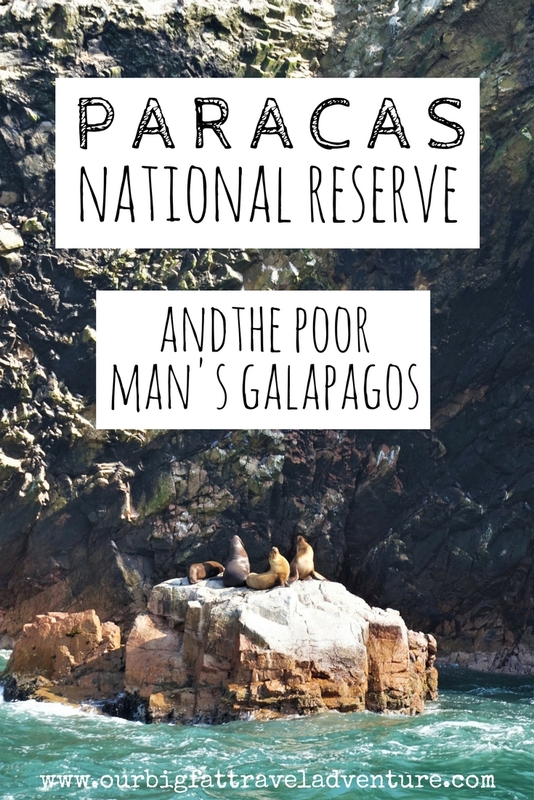 We made a stop at the National Reserve’s museum to learn about the diverse bird and marine life in the area and its pre-Incan archeological sites. Next up were stops at key view points in the reserve, overlooking red sand beaches and unique geological rock formations such as The Cathedral. We even spotted dolphins playing in the water, as well as dozens of different birds. All bus trips seem to stop at a cluster of overpriced restaurants by a beach, we skipped lunch and ate our snacks on the sand instead, then walked up to a lookout point. We kept our fingers crossed for the weather to clear the next day, and fortunately it did. 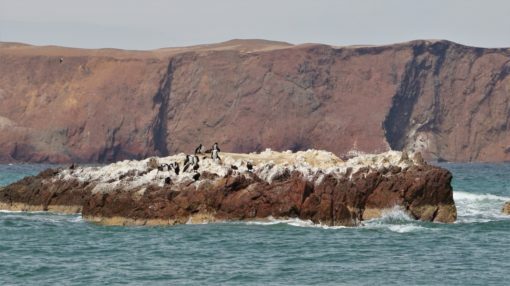 All boat tours leave from the Paracas dock around 8am and last about an hour and a half. You can either book a Paracas boat tour through your hostel or a local tour company, or simply head to the dock and buy a ticket over the counter (prices are listed in the cost section below). 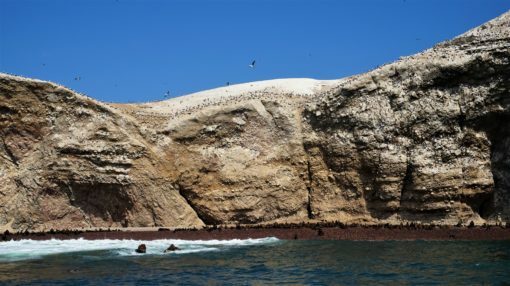 The boat sped across the waves towards the small cluster of Ballestas Islands, which lie around 14 kilometres off the coast of Paracas. Along the way, we stopped to marvel at the Candelabra, a huge rock carving that dates back to 2,500 BC, no one really knows why and how it was carved, but it’s similar to Peru’s famous nearby Nazca Lines. 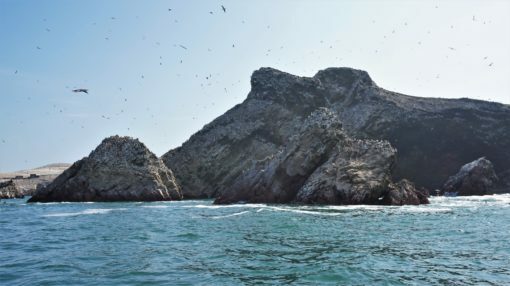 You’ll know when you’re approaching the Ballestas Islands from the squawks of thousands of birds, followed by the smell of their droppings. In fact, the rocky islands are covered in an impressive, thick coating of their waste. 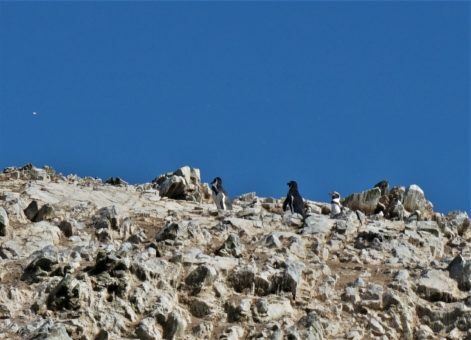 I was immediately taken aback by the scale of the wildlife, as huge flocks of birds covered the rocks and soared above. Amongst the crowds of birds, we could pick out cute stripy Humboldt Penguins, other bird species included Peruvian Pelicans, Inca Terns, Peruvian Boobies and Red-legged Cormorants. In fact, the Ballestas Islands are home to over 1,500 species of marine birds, as well as the sea lions, dolphins and diverse marine life. 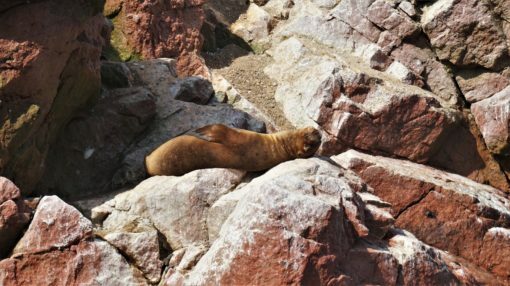 As the boat drew closer, the roar of sea lions joined the melee, and we could pick out hundreds basking on rocks, swimming in the waters and filling caves. There was even a cove covered in mother and baby sea lions, known as maternity beach. Off the shore, mothers were teaching the young pups to swim, calling out to each other as they bobbed in the waves. 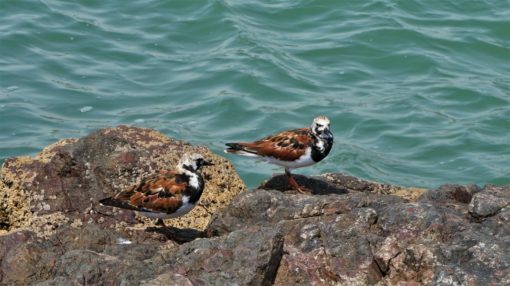 As well as the wildlife, the rocks themselves were fascinating, coloured in shades of red and grey and covered in crabs and a thick layer of birds. There were hidden caves and striking formations, one of an elephant, another of a man’s face. We floated slowly around the islands, taking in the natural beauty and feeling like we were in some kind of Planet Earth documentary. So, how much does it cost to visit Paracas? Prices obviously vary according to your accommodation preferences, but the cost of transport and tours are pretty similar regardless of what companies you go with. 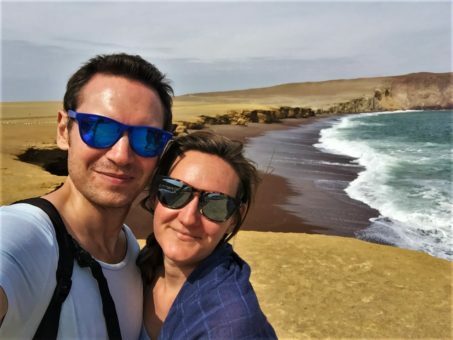 Here’s what we spent on our two-night trip to Paracas from Lima. *You can buy combination tickets from the main tourist marina as well as through tour companies. Separate tickets are available if you just want to visit one attraction. Wondering where to stay in Paracas? The little town is full of hostels, guest houses and a couple of up-market Paracas hotels. We searched Tripadvisor for reviews and opted for a private room in Atenas Backpacker Hospedaje, which was basic but clean and quiet. The owner was lovely, he arranged our tours for us and even gave us a free breakfast on our last day. You can search more Paracas hostels and hotels here. 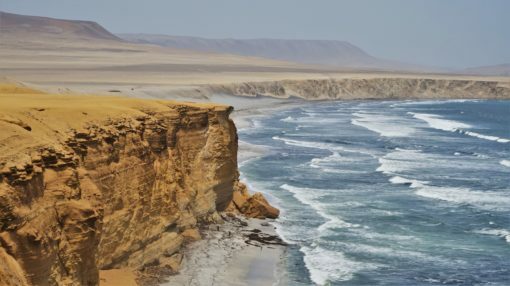 When you visit Paracas, be prepared for windy weather as well as strong sunshine, you’ll need high-factor sun block and sunglasses, as well as a jumper and jacket, especially on the boat trip. A hood or hat is a good idea to protect you from being crapped on by the birds! You can check out our complete South America packing list to see what gear we travel with and don’t forget your camera to capture those scenic views and wildlife shots. 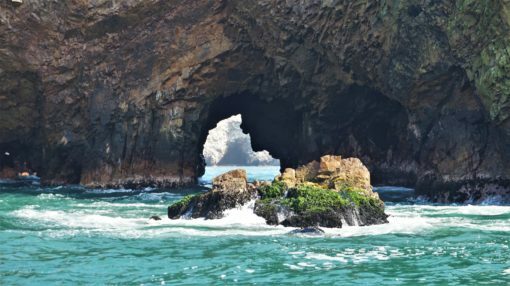 Have you been to the Paracas National Reserve and Ballestas Islands? Got any questions about visiting? Let us know in the comments below. Fun video Amy and Andrew! I love that you’re enjoying this incredible adventure. I know you really went through a series of decisions (and changes) to get to South America so it’s super nice to see you enjoying yourself and exploring such beautiful places. And, sharing it with us. 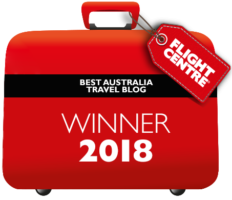 Hi Patti, yes, we did agonise over the decision slightly, as you know 🙂 I’m glad we made this decision though, it may have been the less logical and more expensive option but it has opened our eyes to a new region and helped us figure out where we want to be next. I’m happy I get to share our adventures with you too. Paracas will not be on our Peru itinerary…regretting that a bit now. Sounds like you had a lovely time there, seeing wildlife is always such a joy 🙂 I have never seen Penguins or Sea Lions in the wild…awesome. 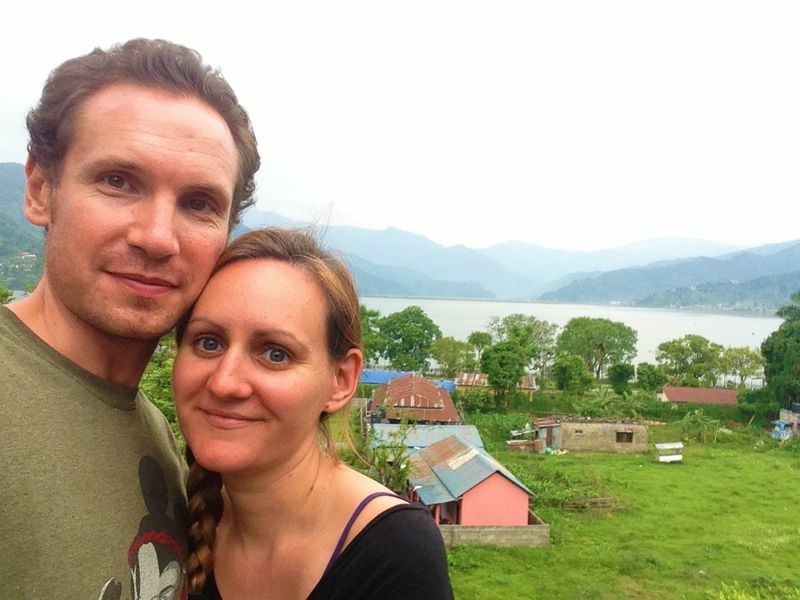 It was great Gilda, but there are plenty more adventures to be had in Peru, you will love it! I.e. 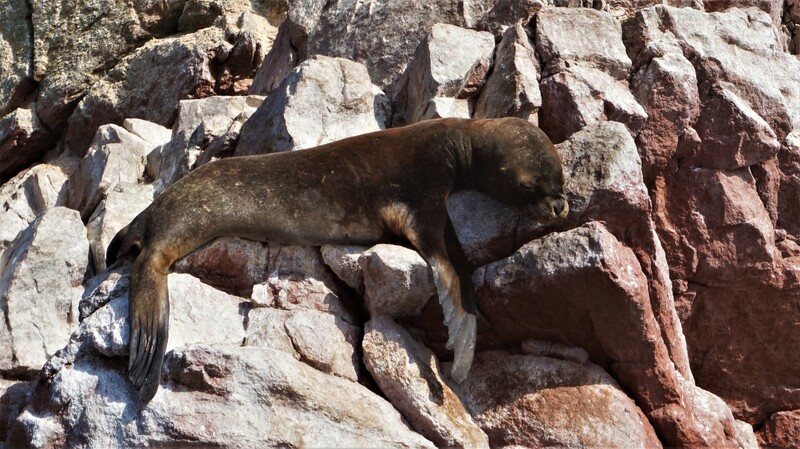 we arrive at 11am and do the Reserve in the afternoon and then do the Ballestas Island the next morning? Many thanks for this post, really useful. We will be in Peru next April and plan to go to Paracas to go to the Ballestas islands and visit the Paracas Reserve. I cannot find an agency online offering a combined ticket. Would you be able to provide us with the contact details of the agency/organiser that helped you the combined ticket? Many thanks! Hi, thanks for reading and commenting. I think you can only buy tickets once you’re there. They are very easy to get, you can buy the combined ticket by walking over to the boat port ticket desk. Any hotel/hostel you stay in will also be able to get them for you very easily. We got ours from Atenas Backpacker where we stayed on the day we arrived in Paracas. Have a great trip!